On Sunday, July 14, Sting will perform at the North Sea Jazz Festival in Rotterdam. Single-day tickets and three-day Festival passes will go on sale beginning Friday, February 1 at 10AM (local time). 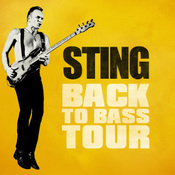 Stay tuned to Sting.com over the coming weeks for additional cities to be announced!